An external wall insulation system from Sto has improved the energy efficiency of two estates owned by Broxbourne Housing Association. Being the largest social housing provider in the borough, the housing association has a firm grasp on social housing needs. Due to an unbeatable combination of thermal performance and impact resistance, StoTherm Classic ideally suited their quality and budget requirements. The regeneration project aims to improve the thermal efficiency of the 1970s blocks to exceed current building regulations. The redevelopment qualified for grant funding under the CERT (Carbon Emissions Reduction Target) programme. The residents are provided with warmer, more attractive homes and reduced fuel bills. The regeneration of Fishers Close in Waltham Cross, and Coopers Walk in Cheshunt, represent the final stages of the redevelopment. It equates to over £7 million of investment to upgrade 8 Blocks, 136 properties in all. Money well spent according to the Housing Association who have made good on their promises to their residents. Broxbourne Housing Association's Chief Executive John Gieson said: "When we bought the Council's housing stock in 2006 we promised residents we would make extensive improvements to Coopers Walk and Fishers Close. Despite working in a challenging economic climate, we have delivered on our promise. We are delighted that all our properties now meet the Decent Homes Standard and many exceed it." The walls of both estates in this project have now achieved an impressive U Value of 0.26 W/m²K. 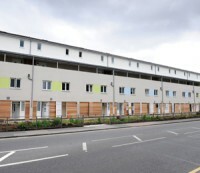 Woodward Ambrose Architects regarded external wall insulation as the only option to upgrade the solid wall structures. Where there were cavity walls, filling the cavity was initially considered as a cost effective solution. But this was a false economy due to extensive thermal bridging and was not a practical or effective option. StoTherm Classic was specified primarily because of its excellent durability. The tough mesh combined with an acrylic reinforcing layer provided a market-leading impact resistance of up to 60 Joules. This provides long-lasting surface integrity even in areas where the render is likely to receive rough treatment. The specified render finish was StoLotusan, the unique Lotus-Effect® finish that actively repels water and washes away loose dirt. Long term, the rendered facade will stay clean and dry for longer, increasing maintenance cycles. This on its own demonstrates a huge cost saving on scaffolding and minimises disruption to the tenants. StoLotusan is available in almost 500 colours from the StoColor System. This was an additional benefit to Broxbourne as they aimed to enhance the visual appeal of the buildings. The StoTherm Classic system was installed using Sto-Turbofix, a quick adhesive system suitable for most substrates. Specifically designed for EPS insulation, the speedily applied adhesive offers comparable thermal characteristics to the boards. This cannot be said with many adhesive products which may reduce thermal performance across a facade. In this project the existing walls were a mix of cavity brickwork and no-fines concrete with a pebble dash finish. The EWI system could be applied directly without the need for extensive repair or renovation to the substrate.